If you ever decide to travel outside of the city into suburbia, be sure to check out a cool martini bar, The Mockingbird. Located in East Bridgewater, MA on Rt. 18, this place has become a hit spot for locals and travelers. If you love martinis, you’ll be in heaven. Walking through the glass doors brings you to a fork in the road, either the huge dining room to the left, usually saved for functions or large dinner parties on crowded nights. The other option is the bar. A decently sized bar sits before many tables, where you can either just get drinks, or try out their fine Italian cuisine. The martini menu is the largest in the south shore. There are over 90 selections, from today’s Most Trendy Concoctions, to the Classic Martini.They offer over 25 high end vodkas, but not all Martinis are Straight Vodka or Gin. Many are Sweet, like the Tutti Fruitti or Flirtini. Some are Tart, like Sour Apple or the Lemontini. Some are Fruity, such as the Patriot and Cherry Cosmo. Others taste like Candy, like our Starburst or Jolly Rancher. 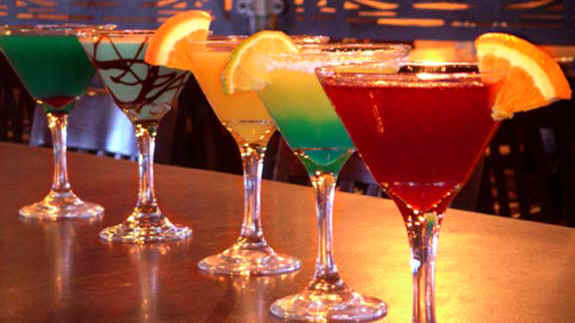 Many drinks are like a Caribbean Vacation, such as Key West, Pina Colada and Tropical Citrus. Looking for dessert? Try Death By Chocolate, Crazy Cow, or Tiramisu. There is something for everyone’s taste. They even feature a specialty Martini of the night, and Thursdays are sample night, go in and try three small martinis for a reasonable price. Feeling hungry? Their Contemporary Italian cuisine gives you fabulous menu choices that use a combination of flavors and styles that are fresh, creative, and satisfying. Nowhere else in the area will you find such variety and creativity in a menu. From the classic Tuscan Chicken Rigatoni, to Macadamia Nut Crusted Salmon, you are sure to find a dish that will thrill you. There is live entertainment Thursday nights, and The Mockingbird is always playing classic, jazzy music. The lighting is cool as well as the atmosphere. Their hours are limited to Wednesday to Sunday, 430 till 10 p.m., so make sure you get there before the bar fills up!